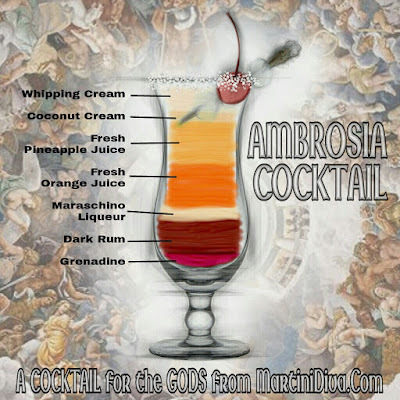 In ancient Greece ambrosia was considered the food of the Gods, and nectar was the drink of the Gods. Today Ambrosia is a fruit salad made up of mixed fruits, particularly orange slices, cocktail cherries (ugh!) and pineapple with whipped cream and/or cream cheese, coconut, marshmallows and sometimes nuts. It's a Southern culinary favorite that originated around the mid 1800's, around the time fruits like coconut and pineapple, previously considered exotic, became more readily available in the U.S. The earliest print reference to Ambrosia is from an 1867 cookbook by Maria Massey Barringer called Dixie Cookery: or How I Managed My Table for Twelve Years. There is an Ambrosia cocktail floating around that employs cognac, Calvados and lemon juice, but I'm going for the classic taste of that fluffy, sweet fruit salad so well loved by America. Primarily because that is what most of us associate with ambrosia. It never hurts to appeal to the masses, right? Rub some of the coconut cream on the rim and dip in coconut flakes then chill the glass in the freezer. Add all the ingredients except the Grenadine to your cocktail shaker and shake until well chilled. Fill the glass with ice then pour the Grenadine in and gently strain the cocktail over the back of a bar spoon on top, garnish and serve. National Ambrosia Day is December 12th.